Kimberley Caravans offer both motorhome awnings and caravan awnings from all of the UK's leading awning brands. 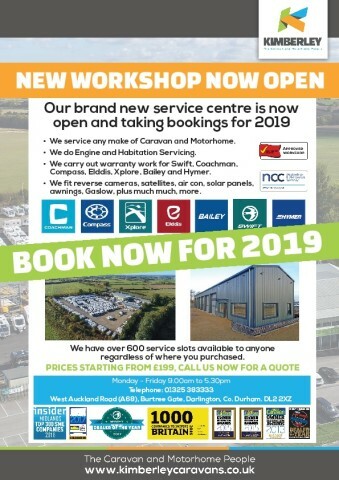 Both of our branches in Nottingham and Darlington are fully stocked with all the latest styles, brand names and accessories so that you can drive away in your new motorhome or caravan with everything you could possibly need. A great way to expand space in either your caravan or motorhome, awnings are the ideal solution to enjoy your holiday to the fullest, and here at Kimberley we are pleased to stock a range of traditional motorhome awnings as well as lightweight porch awnings. You will find a good selection of brands on display including Isabella, Outdoor Revolution, Kampa, Dorema, Ventura, Bradcot and many more at both of our awning shops; located at our Darlington branch near Durham and our Nottingham branch just off the M1. So, if you're looking for full caravan awnings or full motorhome awnings, then look no further. Great annexe Ideal for extending your space even further.